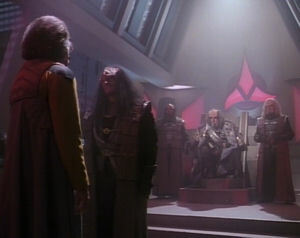 A Klingon exchange officer reveals to Worf that he is his long-lost brother and that their family name is being threatened by false accusations at the Klingon High Council. I love how Kurn awkwardly sits down and uses the word "execute" instead of "engage." So Klingons don't cook their food? After saying he will taste the "burned, replicated bird meat," Kurn actually takes one of the decorative flowers from the tablescape. Picard has an authoritative Klingon courtroom voice. Khitomer seems to be an important place. As a neutral spot near the Romular border, it was the site of the first full peace negotiations between the Federation and the Klingons, as seen in Star Trek VI: The Undiscovered Country. The peace treaty between the two powers is outlined in the "Khitomer Accords." Apparently, at some point, a Klingon colony was established on the planet, which was attacked by the Romulans. Favorite lines: "You may test that assumption at your convenience," and "You are still fat, K'mpec." I wonder how long everybody stands in that circle after Worf has left. This is an important episode in the evolution of TNG in that it sets up a new paradigm for multi-episode character arcs. Earlier episodes like "The High Ground" and "The Offspring," from a character perspective, seem to be running in place, not pushing characters into new places despite the potential to do so. The last Worf-heavy episode, "The Emissary," along with other character episodes from the first two seasons, used backstory to develop the characters as they are, rather than having situations change the characters forever. "The Emissary" does hint at the possibility of more for Worf, but at the end of the episode, Worf's character is in pretty much the same place it was in at the start. Here, in "Sins of the Father," Worf undergoes a change to his character that is irrevocable and introduces a storyline that demands future development. While the Borg arc did give TNG the potential for multi-episode plots, it isn't until this episode that such an overarching mythology is put in place that has a personal effect on the characters of the show. Is this the first time we hear the line "It is a good day to die"? Picard says to Kurn, "Do not forget what he does here today. Do not let your children forget." These words are ironic when you know what will ultimately happen to Kurn in DS9's "Sons of Mogh."